Below is the beginning of the "introducing the author" article which accompanied "A Spot by the Seine"  the Philadelphia Inquirer "Gold Seal Novel" (insert) of June 7, 1942  more familiar today as "Maigret and the Tavern by the Seine." 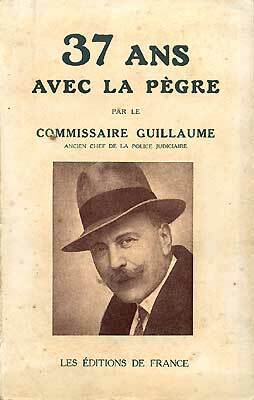 The article mentions "Inspector Guillaime [sic], greatest French detective of his day." The most widely-known profile of any character in fiction is that of Sherlock Holmes. 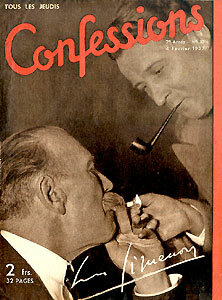 In offering the eighth adventure of his most famous French colleague to be translated, and printed in The Inquirer, it is felt the Maigret profile (shown at left) may intrigue. This character already had attracted considerable attention in France before its author, Georges Simenon, set foot in the "Police Judiciaire." When he did, it was to see his friend Xavier Guichard, director of that Department. As Simenon listened in astonishment, Guichard called into his telephone: "Ask Maigret to come in." 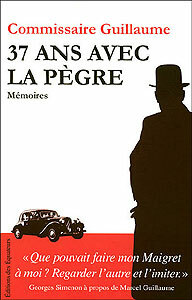 Similarly, in Patrick Marnham's The Man Who Wasn't Maigret; A Portrait of Georges Simenon (1992), he writes [pp 142-143], "The question of whether or not there was an original model for Chief Inspector Maigret has received several answers... ...in particular there was Chief Inspector Guillaume, head of the brigade spéciale of the Parisian police judiciaire. Although the character of Maigret came from Simenon's imagination, and from his past, many of Maigret's methods seem to have been based on the techniques of Chief Inspector Guillaume." 'Young Lesueur will take your place in the Hotels Squad, from now on, and you shall put yourself at Inspector Guillaume's disposal.' ... At last I was to enter the Special Squad. Maigret had found the case [of Honoré Cuendet, the "lazy burglar"] so intriguing, that he had persuaded his superior, Superintendent Guillaume, to ask for a medical report on the prisoner. "Hello, is this the Flying Squad headquarters, Nantes? Maigret speaking .... Put him on .... Guillaume? ... Of course my dear fellow ... I'm fine ... You haven't wasted much time .... Yes, I'm listening ...."
Willy Innocenzi, on his Simenon website, has posted the following article in Italian. He also provided the original French version, which I've translated into English here. Chief Inspector Guillaume's death touches me personally. It is said that he served as the model for the character of Maigret, and that is partly true. When, after the publication of the first three or four novels of the series, Xavier Guichard, Director of the Judicial Police, wanted to put me in touch with some flesh-and-blood police officers, and at the same time expose me to the actual operation of the service, it was Chief Inspector Guillaume who was entrusted with the task. He spoke to me about the techniques of interrogation, and at the same time introduced me to one of his senior colleagues, a great expert on the subject, Chief Inspector Massu, whom he succeeded some years later. These two men, of equal conscientiousness and professional ability, were very precious to me. Which of the two had more influence on an already existing, but still sketchy Maigret? It would be very difficult to say, all the more so as I have known other officials of the Judicial Police, who must have influenced me, more or less unconsciously, as well. Guillaume, Massu and I became good friends. We often met again, and I was present at the Quai des Orfèvres on the day Chief Inspector Guillaume's colleagues, with glasses of champagne in hand, surrounded their chief for a last time before his retirement. "They are crazy," Guillaume told me, touched and a little embittered. "At fifty-five, when we have learned our work well, we are thrown out..."
He still had a long and active life as a private detective, before his death at the age of ninety-two. For me he was not only a friend, but Maigret's elder brother. Inspector Marcel Guillaume, of the French Sûreté, detected the signs of murder hidden behind the apparent suicide of a couple in a Paris flat, and brought the strange killer to justice. He is the real-life prototype of fictional Inspector Maigret. "Inspector Marcel Guillaume  the fabulous prototype of Georges Simenon's fictional Maigret  took personal charge of the investigation of the crime." Others of the police mentioned in the article include, Assistant Police Chief Gaston Mozer, of the Seine Prefecture; M. Lansom, juge d'instruction of the district; Dr. Paul [! ], of the Institute of Forensic Medicine, who performed the autopsy; and Inspector Gripois, Guillaume's colleague. The trial was held before Judge Peyre at the Seine Assizes, and on October 13, 1934, Nozières was found guilty and sentenced to die on the guillotine, later commuted (by President Lebrun on Christmas Day) to life imprisonment. Although not mentioned in the article, Violette Nozières was released after 12 years, and pardoned by de Gaulle in 1963. The Nozières affair was the subject of Claude Chabrol's 1978 film, Violette Nozières. The case was mentioned in Assouline's biography of Simenon  (p. 123) "The Paris press was convinced that public opinion was as excited about the Stavisky-Prince affair as it had been by the cases of Landru and Violet Nozières."  in the chapter describing Simenon's attempt at playing real-life detective. The Landru case, that of a mass-murderer, was the subject of a sidebar to the Police Detective article on the Nozières murder, and was also mentioned in three Maigrets  once where M says he had nothing to do with solving it, and twice where he implies he did! This photo of Guillaume (seated, at right) appeared in the February 19, 2003 issue of L'Express International magazine, as a sidebar to the article "Simenon, l'arbre à livres" by Michel Grisolia (pp 8-11) for the 100th anniversary of Simenon's birth. 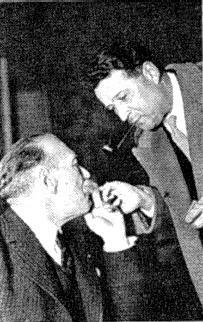 With his massive body and black look, Chief Inspector Guillaume (seated on the right in this unpublished photo) was the principal model for Georges Simenon's hero. The writer met this policeman, head of the criminal brigade, at the very beginning of the 1930s. At his side, the father of Maigret impregnated himself with the atmosphere of 36 quai des Orfèvres, attending cross-examinations, meetings with brigade chiefs and psychiatric evaluations at the Dépôt. 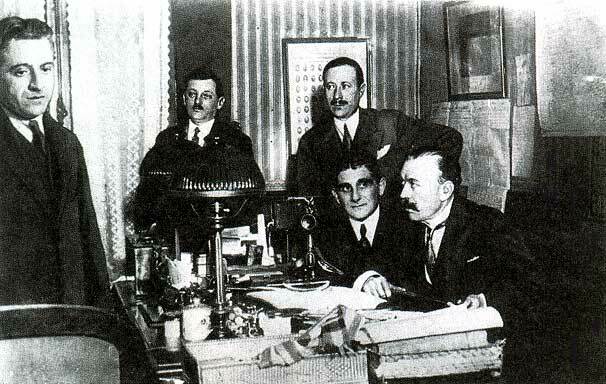 Chief Inspector Guillaume, whose notable investigations included Bonnot, Landru ("the only man who succeeded in making me lower my eyes") and Stavisky, here interrogates the jeweler [Charles] Mestorino (standing on the left), accused of having murdered another jeweler, in February 1928. 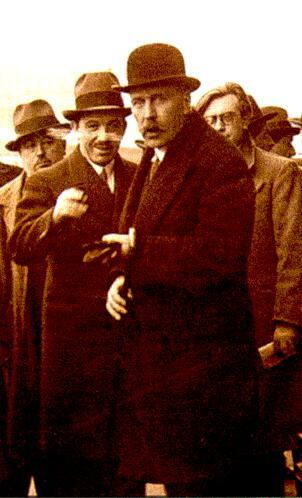 Standing on the right is Inspector Février, who will become the faithful Janvier of Simenon's novels. Simenon on Guillaume and Maigret! "My mother remembers that he was an impressive man. He used to have a miniature replica of a guillotine on his desk to cut his cigar tips. He played with it while interrogating suspects, which made them think about the consequences of their acts and finally drove them to be cooperative and willing to talk. After his retirement from the police, he set up a private eye agency." 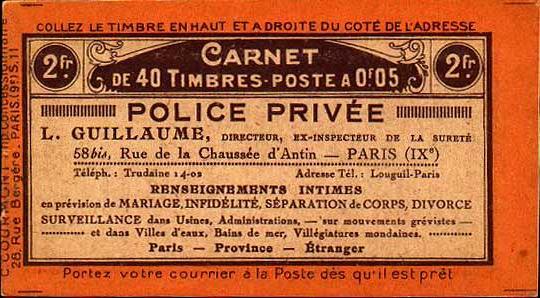 is for a private detective agency directed by L. Guillaume, ex-Inspector in the Sûreté. In that year, Marcel Guillaume would have been 40.